Love watching movies with your family and friends? Well, with summer on its way for folks living in the Northern Hemisphere, then how about letting your next movie watching session be held outdoors? That’s exactly what Hammacher has in mind with their Outdoor Inflatable Theater. 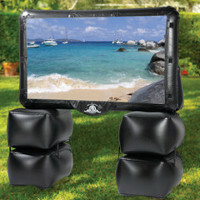 The name itself says it all – this inflatable theater system will be able to turn your backyard into a vivid cinema. Of course, you would do well to have some anti-mosquito devices hanging around just in case, no? The screen comprises of a 72″ bright, white vinyl, where the frame will inflate in under five minutes thanks to the built-in electric pump. Made out of weather-resistant PVC, you can use it near swimming pools or place it outdoors even when it is the rainy season. Forget about Full HD images being shown on this though – the projector that it comes with maxes out at 480p resolution, sporting 16:9 aspect ratio, a contrast ratio up to 600:1, with 900 lumens for optimal brightness. It is capable of hooking up to various video sources via component, VGA, or HDMI, while supporting USB and SD memory cards. Needless to say, its speakers are water resistant as well, although 5-watts of juice ain’t gonna cut the mustard for more action packed films that you intend to enjoy. At $999.95 per purchase, convince the missus that this can be used indoors as well and she will most probably give her nod of approval. Amazingly my team in grad school mgmt marketing class came up with this concept for our group project and was poopooed by the teacher. Low and behold here it is in reality 6 years later. I am soo surprised to see this in reality! Wowie! !